Step into one of our Primary School classrooms and you will hear the hum of happy students, and feel the energy of eager learners. Our experienced teachers believe in the development of the whole child, and carefully design lessons in which reading, math, language development, art, social studies, science, and multicultural education are joined. 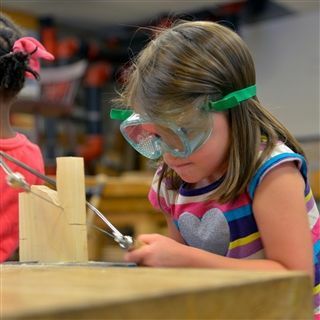 Using thematic, hands-on activities our Pre-K and Kindergarten students learn best and grow their understanding of the world around them through exploration, connection, and discovery. Above all else, there is always a strong emphasis on friendship, cooperation and kindness. Our Author of the Month study doesn’t just involve reading and writing but includes science, cooking and art! Rhyming is the key to reading. Building with blocks take a steady hand, patience and imagination. We don't always use pencils to make our letters. Sometimes the students are the best teachers. We hatch over 50 butterflies in our room-sized canopy. Sorting and classifying? That's math! Painting doesn't have to go on paper! Our classroom is splashed with color. Real saws in woodworking? You bet! We explore every corner of the campus. Catching frogs is a Pre-K favorite. Measuring and mixing is tasty math.